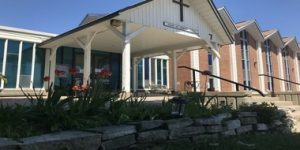 Brief History of the Parish of St. Richard of Chichester, Nepean, Ontario. The Parish of St. Richard of Chichester began as an expansion of St. Peter’s Anglican Church on Merivale Road in Ottawa. By 1955, it became clear that a new parish would have to be established in City View in Nepean. In September 1955 an offer to purchase land between Rossland and Withrow Avenues on Merivale Road was accepted. Worship for the new parish began in the City View Public School October 16, 1955. On October 30, 1955, Bishop Reed visited the new worshipping community and declared that the new parish would be named St. Richard of Chichester. Richard of Chichester (Richard de las Wyche) was borne in 1197 in Wyche (now Droirtwich) near Worcester in Shropshire, England. AS an adult, Richard decided to pursue Holy Orders and studied at Oxford, Paris, and Bologna. Richard did not study theology and became a chancellor in the church. He was ordained as a priest in 1244. Although not favoured by King Henry III, the Archbishop of Canterbury named him Bishop of Chichester. While initially denied an income by the King, he moved about on foot and ministered to his flock, winning their love and affection. He had a difficult life as he continually met with poverty, but his strong character pulled him through all adversities. St. Richard left us with an inspirational prayer that is perhaps the best revelation for the man and the Christian character. The first St. Richard’s parish Bazaar was opened by B Charlotte Whitten on December 3,1955. The first Vestry meeting took place on January 31, 1956. It was decided to first build the Parish Hall, which would provide for both worship and recreation. The Church Hall was completed and dedicated on November 18, 1957, even though some activities took place in the hall before that date. Plans started immediately to build a church building. On Easter Monday, April 23, 1962 the Breaking of the Ground for the church building was performed. Subsequently in October the Foundation Stone was laid. The foundation of the church building was laid. On January, 1963, the largest gathering of Anglicans ever known at St. Richard’s congregated for the dedication of the new Church by the Bishop of Ottawa, Bishop Reed. The first worship service held in the church was held the next day, February 1, 1963. After a two year process of discernment and discussion members of the parish overwhelmingly voted amalgamate with St. Michael and all Angels Richard’s to form the new parish. The new parish of Julian of Norwich was formed on September 27, 2017, and took up residence in the buildings previously occupied by St. Richard’s. As an expansion of St. Peter’s, St. Richard’s initially shared Rev. Rev. A.E.O. Anderson with St. Peter’s. The following clergy subsequently served as Rector of St. Richard’s: Rev. William Ebert Hobbs; Rev. John Charles Garrett; Ven. William (Bill) Wright; Rev. Bruce Crockett; Rev. Canon Keith Calder; Rev. Canon Michael Fleming; Rev. Margo Whittaker; Ven. Mary Ellen Berry.